Take a bowl. Add rajghara, tapkir, ginger-green chillies paste, baking soda, salt, 1 tablespoon of oil, water as per the need and knead soft dough. Take about 2 teaspoon of mixture and make small balls. Take a pan and heat oil. Deep fry balls in batches. Put it in water till it is soft. Drain water and keep it aside. Take a bowl. Add curd, sugar, salt and mix it well. Put it in the refrigerator to make it chilled. For serving, take three bowls. 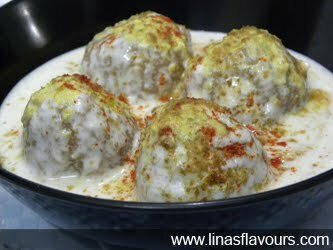 Put rajghara balls, add curd, pour some green chutney, sprinkle garam masala, red chilly powder and cumin powder as per your taste. You can even add tamarind chutney if you like.